The man-made warming camps keep their political science alive by clamping on climate science and data that contradict their belief. Their end-goal remains the same: global ecological central planning. From the United Nations (IPCC, FCCC, UNEP, WMO, etc.) to the foreign aid establishments (WB and ADB especially) that give out tens of billions of dollar in climate adaptation/mitigation loans and renewable energy (RE) loans, to national governments to local governments. The various environmental lobbying groups like the World Wildlife Fund (WWF), Greenpeace and Oxfam play the alarmist role to support such global agenda. Kyoto Protocol (KP) of expensive and bureaucratic carbon cap and trade and similar schemes will end next year. The UN Framework Convention on Climate Change (FCCC) and many member governments tried hard to hammer a successor to KP, thus the high profile Copenhagen meeting in December 2009, then the Cancun meeting in December 2010. Those expensive global meetings attended by thousands of UN, foreign aid, national government officials, environmentalist groups and media failed to produce a binding agreement that will succeed KP. The debate about climate is and was, NEVER SETTLED. There was no such thing as "scientific consensus" of anthropogenic (man-made) global warming (AGW). The big problem of the warming camp is that most data available show that recent global temperature is either flat or declining. Air or tropospheric temperature (UAH and RSS satellite data), land surface temperature (HadCRU data), sea surface temperature (NOAA, BOM, AMSRE, etc. data). Even sea ice data in both Arctic and Antarctica show a purely natural, 100 percent natural cycle of melting-growing-melting-growing of ice each year. From January 2002 to May 2011, the trend line for UAH and RSS air temperature data showed a decline of 0.03 C, while carbon dioxide (CO2) concentration in the atmosphere kept rising, now at nearly 400 parts per million (ppm). There is little or zero linkage or causality between the two. From 2000 to 2011, there were 4 periods of El Nino: 2003, 2005, 2007 and 2010, and there were 6 periods of La Nina: 2000, 2001, 2006, 2008, 2009 and 2011. There is no such thing as “unprecedented warming” or “unequivocal/definite warming”. There is only the natural climate cycle of warming-cooling-warming-cooling. Since most if not all, actual climate data show a flat or cooling trend, the warming camps are forced to stick to their faith and belief in the projections made by the IPCC global computer models (GCMs) that are said to be very sophisticated. Their GCMs, say that 90 years from now, by the end of the century, global temperature will rise by 2.4 to 6.3 C, with "best case scenario" of 4 C warming. Now, all weather projections, also using the most sophisticated computer models and mathematical tools, cannot even predict with at least 90 percent certainty, what will be the weather and correct temperature range some 5 or 10 days from today. So why were we made to believe that those projections 90 or 100 years from now? 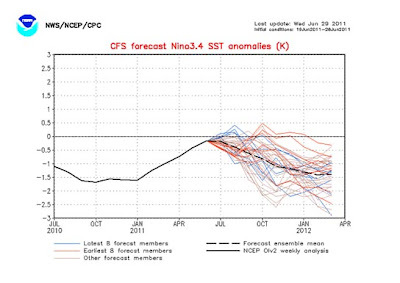 Consider this projection of where the current La Nina is headed to. Will it end soon this year, or late this year, or next year or what? The color-coded lines (perhaps almost a hundred) represent various projections by different models. The black dotted line is the average for those different projections. 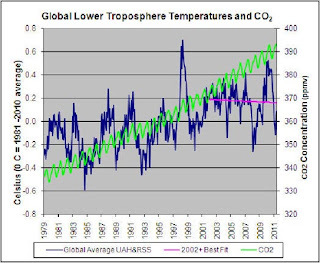 This graph is a double slap on the AGW fiction. First, the number of SUVs, airplanes, ships, malls, factories and “non-clean” power plants keep rising, but global cooling, the colder than normal condition of La Nina, is going to be extended. It could be a “double dip” La Nina, stretching for two years or longer, when an average El Nino or La Nina phase normally lasts for about 12 months only. And second, the range of projections is as wide as 3 C, indicating deep uncertainty among those sophisticated computer models even if they are just projecting future temperature up to nine months ahead. If projecting the temperature 1-9 months ahead can be uncertain and unreliable, why are we made to believe that those projections of up to 6.3 C warming 90 to 100 years from now are reliable? There is a repeated accusation of "climate change deniers" for people who do not believe the AGW fiction. Even the most skeptical scientists and ordinary folks recognize and hence, do not deny climate change. Climate change of warming-cooling-warming- cooling is purely natural, 100 percent natural. A better term is “natural climate cycle”. What is being "denied" by those who question the AGW fiction is the "man-made warming" claim. Global warming DID happen. Global cooling also DID happen, like the cooling of the 70s, even if the number of SUVs and malls were rising. Now we are in a period of global cooling despite the much larger number of SUVs, computers, buildings, commercial jets, etc. The warming camp deny (in a sense they are also “climate deniers”) the role of natural factors on the Earth's climate: the Sun, galactic cosmic rays (GCRs), clouds, volcanoes, water vapor, etc. For the warmers, the past century's warming was almost 100% due to human carbon emission. Thus, all these mad regulations and rackets that they have advocated and enacted into laws to control carbon emission, to control human progress. AGW is the biggest science fiction of the century. It has persisted because it involves the biggest attempt at global ecological central planning by the UN and many governments, with the cheering applause of big environmentalist groups and corporate interests that will benefit from carbon cap and trade, energy rationing and other forms of government coercion and new business cronyism. See also, Part 13: IPCC 1990 projections don't match with reality, and Part 12: Recent flooding are unprecedented?